:: Tags: Hockey, Sports, Surgery, WTF!! As most of my readers know, I love ice hockey, but as we all know it is a rough, competitive sport that is played at an extremely fast pace. Even though we wear lots of protective gear and take extra precautions to safe guard ourselves against injuries, they still happen. I myself have been playing hockey at the competitive adult level now for over twenty years and yes, I’ve had my share of injuries over the years. Normally you go home after the game with just bumps and bruises, or maybe the occasional sprain, torn muscle or even a dislocated shoulder. However, this week I got to add a new page to my dossier with my first ever broken bone! The aftermath of the surgery on my left clavicle – Virginia Hospital Center – Arlington, VA.
With only about 5 minutes to go in the third period, I was on the fore check in the offensive zone going hard for a loose puck in the corner, when I was tripped up by another player and found myself sliding head first into the boards. Trying to prevent a direct head impact with the boards, I started to turn my body as I was sliding and thus ended up with my left shoulder squarely impacting the boards instead. I knew instantly after the collusion that I had done some kind of damage to my shoulder, but was not sure exactly what it was. I was able to skate back to the bench under my own power and then pulled myself from the remainder of the game so that I could go to the locker room and remove my shoulder pads to inspect the damage. Sure enough, it was obvious that I had broken something in my shoulder. There was nothing protruding through the skin, but every time I tried to lift my arm I could see the broken bone pop up like it was trying to break through. After changing out of my gear, I went home to let my wife know what had happened and then drove myself to the hospital to have it checked out by a doctor. The X-rays reveled that is was in fact a broken left clavicle and it would take surgery to correctly repair it. 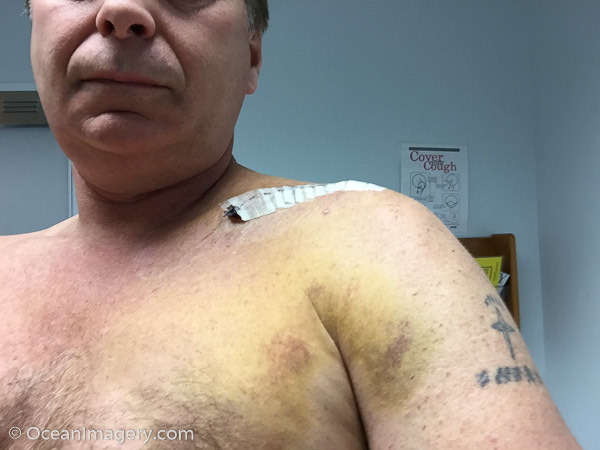 I was lucky enough to get scheduled right away for the surgery and also to have one of the leading shoulder surgeons in the area do the work. The surgery went well and took just under two hours… and now I have a titanium plate and 7 screws holding my collar bone in place so it can grow back together correctly. Oh yeah, and I will have another nice scare to show off! 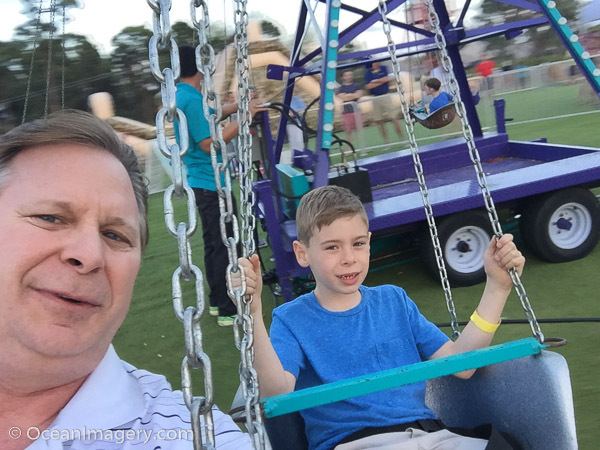 Taking a selfie with Dylan on a carnival ride @ Harbor Ridge Club – Palm City, FL. As per normal, we spent our spring Easter vacation down in Palm City, Florida with the grandparents. The private community that my wife’s parents live in always puts on an awesome grandparents weekend for all the visiting families and kids. It starts of with fun kids activities at the club, then an Easter egg hunt on the golf course and finally ends with a huge carnival on the fairway of the first hole. This is a huge event for the entire community and the kids love it. The food is great and the adults can indulge in an adult cocktail while chasing the little ones around between the different rides and booths. My favorite part of the weekend is the Sunday morning brunch at the club. They have a huge all you can eat buffet with everything you could think of and their Bloody Mary’s are to die for! 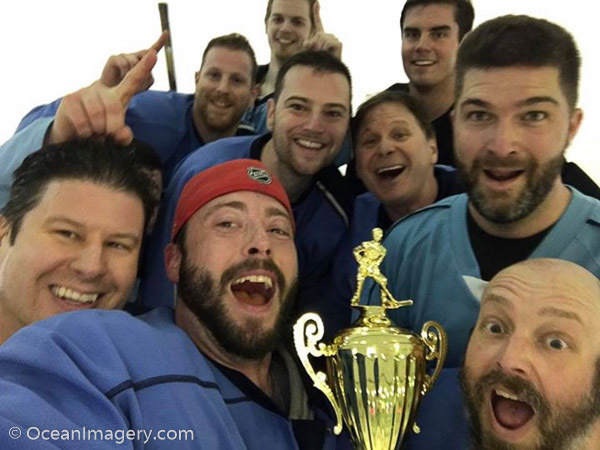 Fairfax Hockey League 2016-2017 ‘D1’ Division Champions – Fairfax, VA.
“We are the champions… We are the champions… We are the champions… of the FFHL! !” Yes, we did it again… the D1 Fairfax Bulldogs Hockey Team has won another Winter Championship in the Fairfax Hockey League! There is nothing better than sharing a 10 to 1 win with your hockey brothers in the championship game! I think we will be moving up a division next season because we are clearly too good for this one! Journal RSS Feed - Subscribe!